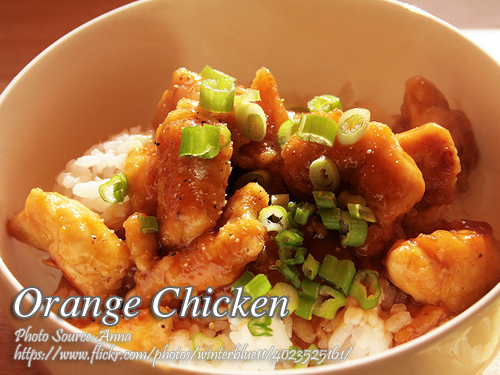 Orange chicken is a delicious chicken dish of deep fried chicken breast then coated with thick orange sauce. As far as I know, this is a Chinese dish of Hunan origin that became popular in the North America. One good thing about this recipe is simplicity and all the ingredients are readily available in supermarkets. As much as possible, use fresh orange juice in making the sauce. But if you are really budget conscious or fresh orange is not available, you can use powdered orange juice mixed with water. To cook orange chicken; Combine flour, salt and pepper. Mix to combine well. Put some flour in a plastic bag or a plastic container. Dip and coat the cubed chicken breast with beaten eggs and put in the plastic bag containing the flour. Put a few pieces first just enough to shake and coat the chicken with the flour. Do this by batches until all the chicken are coated and place in a plate or tray. Heat cooking oil in a deep frying pan just enough to deep fry the chicken. Put the coated chicken fillet in the frying pan and fry until golden brown. Drain in paper towels and set aside. Orange chicken is a delicious chicken dish of deep fried chicken breast then coated with thick orange sauce. Combine flour, salt and pepper. Mix to combine well. Put some flour in a plastic bag or a plastic container. Dip and coat the cubed chicken breast with beaten eggs and put in the plastic bag containing the flour. Put a few pieces first just enough to shake and coat the chicken with the flour. Do this by batches until all the chicken are coated and place in a plate or tray. Heat cooking oil in a deep frying pan just enough to deep fry the chicken. Put the coated chicken fillet in the frying pan and fry until golden brown. Drain in paper towels and set aside. To make the orange chicken sauce: in a small pan, pour water, soy sauce, vinegar, food coloring and orange juice. Bring the mixture into a boil then add minced garlic and simmer for 4 minutes. Then add the brown sugar and simmer until all the sugar is dissolved. Add the spring onion and cornstarch slurry. Mix well and simmer until the sauce is thick. Combine the chicken with the orange sauce and mix well until all the chicken is evenly coated. Simmer until the chicken have absorbed the sauce and becomes very thick. Serve hot with steamed rice or as rice toppings. I’ll try this tonight! Thanks! Hi Elmer, good luck on your cooking! This tastes great, thanks for posting the recipe! Hi Markus, you are welcome and I’m happy to know that! Thanks also for sharing your experience!